Leeches, which many of us associate exclusively with Stand By Me and Game of Thrones, were recently used to reattach a woman's ear after she was mauled by a pit bull. 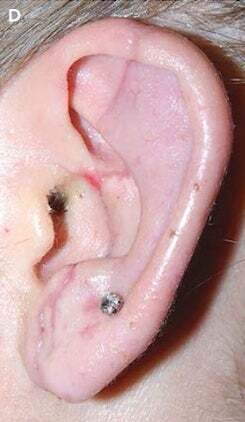 A new clinical case study in the New England Journal of Medicine describes how doctors were able to replant her amputated ear with the help of medicinal leeches. Surgeons were able to successfully reattach the ear to the artery, allowing blood to flow in to the organ, but were unable to find a functional vein to drain blood back out. That's where the leeches come in. For 17 days, they provided temporary drainage by being leeches, giving the woman's body the time needed to produce suitable veins for complete implantation. She was treated with antibiotics and anti clotting drugs and recovered marvelously. 24 days later, the ear was back to normal and 4 months later, things are still looking good. Her hearing was not damaged in the attack. This procedure isn't all that uncommon actually, and the worms are even sold as medical devices. Primarily used in patients with skin grafts and amputations, leeches are attached near a graft or reconnected body part. They releases natural blood thinners to prevent clotting and encourage blood circulation in the area. Leeches can eat up to 8 times their own body weight before falling or being pulled off, allowing for vein growth and circulation. Don't worry though, barriers are in place to make sure they doesn't go wandering around to other parts of the body. Medicine, science, and bioengineering have improved by leaps and bounds in recent years, but sometimes you just have to go with the tried and true therapies discovered over 2,000 years ago. This picture is of her repaired ear courtesy of the NEJM. Head to the original article for the before and during shots. TW: blood and a leech on someone's ear.